Sony announce support for Dolby Vision HDR in their consumer products. They join LG, Leowe and Vizio. HLG and HDR10 are the cheaper less featured HDR alternatives. Colorist Society International (CSI)" is the first Professional Association for Motion Picture Colorists. In its inaugural year CSI is recognised by IMDB. According to World TV Production, Netflix and Amazon have more than doubled their annual expenditure on programming, reaching $7.5 billion in 2015, and eclipsing CBS, HBO and Turner in spending, as well as several countries, including South Korea and Australia. Both companies are delivering UHD (4k) and HDR content. Disney's "Tomorrowland" is the first film to be projected in Dolby Vision with HDR laser projection. I work with Dolby as HDR Colorist Consultant on a 4000 nit Pulsar in London. UHD Alliance is formed to agree HD and better standards between studios, manufacturers and distributers. Digital Vision is acquired by its management team who promise to preserve the heritage of the 26 year old company. Dolby acquires Doremi Labs, a key player in digital cinema playback servers. Dolby later announces Dolby Cinema plans. Dolby Cinema will feature HDR laser projection, Dolby Atmos sound and large format screens. The best technology has to offer and the first real competition to IMAX. AMPAS announces the release of ACES version 1.0. After two years of use in beta there is much excitement and high expectations. Interstellar is shot on 65mm IMAX film and presented as 70mm film projection at selected cinemas. This may well be the last film to be shot and finished for 70mm. The experience of a life time! Yes, of course I saw it. First public show 6 November 2014. Just brilliant. IBC. Christie demonstrate their Six Primary laser projector to show "Life of Pi" and Dawn of the Apes" in Dolby 3D, at 14 ft lamberts on a white screen, complete with Dolby Atmos sound. Dolby Vision also made a big impression. The prototype HDR monitor can peak at 4000 nits - 40 times brighter than rec 709. BMD buy Eyeon and its Fusion vfx software. Within 2 months there is a free version. Blackmagic Design announce their new 35mm and 16mm film scanner based on Cintel Ditto and Image Mill technology. The new scanner has a small footprint and uses Thunderbolt 2 to transfer 35mm at 30fps in UHD resolution. And it costs under $30,000! Quantel maker of Pablo buys Snell, maker of Alchemist. NHK transmit 8K Super Hi Vision for the first time in an experiment. The 33 million pixels per frame broadcast is received succesfully 27 km away. Paramount releases The Wolf of Wall Streetin digital format only. It is the first Hollywood Studio to leave film behind entirely. None of their future releases will be on film print. Only 8% of US cinemas do not have digital projection kit. ACES version 0.2.2 is released and includes a revised RRT and updated ODTs as well as introducing ACESlog, ACESproxy and a way to reverse the ODT, RRT transforms. Deluxe shut the last film lab in Australia in April. Park Road close their New Zealand Lab in June. There are no longer any labs in New Zealand or Australia. Kofic shut the last lab in Korea too. The nearest film lab to Australia is now Kantana in Thailand. All three labs in South Africa are closed. There are similar stories around the world this is truly the end of an era. Film R.I.P. Fuji Film announced on April 2, 2013 that they have stopped production of most Motion Picture Film products. As a result b/w and color negative, positive and intermediate stocks are discontinued. Digital workflow products such as Recording film for Digital Separation [ETERNA-RDS] for long-term archiving will continue. Cintel International liquidated. BMD buy its IP and product range including scanners, telecines and noise reducers. ACES workflows and transforms are ready for mainstream use. Nucoda Film Master and Da Vinci Resolve amongst others introduce the necessary color transforms for ACES work. The Academy of Motion Picture Arts and Sciences wins an engineering Emmy in the same year. Peter Jackson shoots The Hobbit on Red (5k) cameras in stereo at 48fps. That's about 16 times the storage of a regular 2k production. 4K and 8K UHDTV formats - Ultra High Definition Television - announced in May 2012 by ITU-R Working party 6C. They are constructed as multiples of 4 and 16 times the 1080p1920 format in ITU-R Rec. 709 and allow up to 120 pictures/second. Kodak commences voluntary Chapter 11, financed by Citigroup. The greatest pioneer of both film and digital imaging plans to sell 1100 of its patents to finance a new future. Kodak engineers were awarded 19,576 US patents between 1900 and 1999. Adobe buys Iridas. The deal includes the rights to the Speedgrade family of products as well as the development team. Adobe Premiere grows in popularity as well as features. THX buy cineSpace color management software. ICA becomes a training partner to THX. Apple update Final Cut Studio to FCPX to the disappointmet of many professionals. Biggest shock is that Color is dropped from the package, and is no longer available. Image Systems buys Digital Vision, and the new Precision panels are released. Blackmagic Design release DaVinci Resolve 8.0 with new curve tools and a multi track timeline. They also launch Resolve Lite, a free version with few limitations. Autodesk release Flame Premium that bundles Flame, Smoke and Lustre all in one package. I had been consulting on the new panel design for over 3 years. It was fantastic to see so many ideas make it to the final design. Blackmagic Design announces DaVinci Resolve 7.0 for Mac OSX and a price of $995. Until now DaVinci Resolve systems cost from $200,000 to over $800,000. Avatar becomes the fastest film to take one billion dollars at the box office. It took just 17 days. Blackmagic Design buy da Vinci Systems, which was in danger of closing down. International Colorist Academy launched and the first system independent colorist courses happen. Digital Vision show stereoscopic 3D monitoring and Turbine, a background render booster that uses Blades, for Film Master. Color Transform Language (CTL) published as SMPTE RDD-15. CTL plays a crucial part in developing ACES. Apple introduces Color (formerly Silicon Color Final Touch) as part of the Final Cut Studio 2. Digital Vision buys Nucoda, developers of Film Master. Digital Vision Optics (DVO) launched, providing software version of DVNR noise and dust tools. Autodesk buys Lustre from Colorfront. Cintel announces GRACE is now available as an external film grain reducer. 50 leading technologists cooperate with the Science and Technology Councilof the Academy to begin work on an architecture and supporting tools for digital motion picture production, mastering and archiving. This is the begining of ACES. The Polar Express is released as IMAX 3D, which earns 14 times as much as the 2D version and causes renewed interest in producing 3D feature fims. da Vinci announces Resolve software color corrector. Cintel launches updated Millennium 2, a CRT based 4K data-cine. Thomson launches Spirit 4k datacine. Autodesk licenses Lustre (previously 5D Colossus) by Colorfront. Nucoda Data Conform used on Harry Potter. ILM release OpenEXR to the public. Silicon Color formed to develop Final Touch, which later is bought by Apple and becomes Color in Final Cut Studio 2. Apple FCP introduces 3 way color tool. Sony HDCam SR vtr launched. 5D ceases trading, Colorfront continues. The fifth Star Wars film Attack of the Clones, is the first major Hollywood film shot entirely on digital (video) cameras. Cintel acquires the assets of competitor Innovation TK including the Millennium data-cine. Cintel launches DSX - the worlds first 4K data-cine, which includes Oliver, formerly OSCAR optical dust and scratch removal. Cintel International acquires the assets of competitor Innovation TK including the Millennium data-cine. da Vinci adds Colorist Toolbox for all 2K systems. da Vinci 2K Plus color corrector introduced. It is controlled by a Linux computer and has significantly better Primaries and secondaries. da Vinci fixed many of the flaws in the 2k. Now the best hardware color corrector that will ever be built. Thomson, formerly Philips, formerly BTS, formerly Bosch, launches Viper electronic camera with 4:4:4 log output. Cintel, formerly Rank Cintel, launches OSCAR a revolutionary optical dust and scratch removal system for their telecines. The product is later renamed OLIVER after complaints from the OSCAR awards people. This was all my idea, and I later got a similar feature into Film Master. The year that DVD sales overtake VHS sales. O Brother, Where Art Thou? – The first time a digital intermediate was used on the entirety of a first-run Hollywood film which otherwise had very few visual effects. The work was done in Los Angeles by Cinesite utilizing a Spirit Datacine for scanning at 2K resolution, a Pandora MegaDef to adjust the color and a Kodak Lightning II recorder to output to film. Quantel launch the IQ platform, a hardware system for editing, compositing and grading SD, HD and digital film. da Vinci adds Defocus options to 2K systems. Sony launch the Vialta Telecine. Multi format (16 mm, S16 mm, 35 mm, S 35 mm), multi standard (601 SDTV, HDTV and data) field array ccd device with internal primary color correction. Formerly known as FVS 1000. Ceased production around 2004. Philips, formerly BTS, formerly Bosch, introduces Specter as the first virtual telecine. Read my Layer It article to learn more about Tiers, Channels and Layers. da Vinci Academy formed when I join them in Florida. I had been doing da Vinci training for many years, and in 1998 they invited me to Florida to start up a dedicated colorist training facility. da Vinci introduces the 2Kcolor corrector for SD, HD and data.It is controlled by an SGI O2 computer. Avid acquires Softimage Inc. from Microsoft Corporation. Avid also delivers Symphony, a nonlinear noncompressed editing system for Windows NT, priced at $150,000 for a basic turnkey system. Symphony was essentially a noncompressed version of Media Composer and included color correction. Pleasantville – The first time the majority of a new feature film was scanned, processed, and recorded digitally. The black-and-white meets color world portrayed in the movie was filmed entirely in color and selectively desaturated and contrast adjusted digitally. Kodak discontinues Cineon. However the file format .cin and its derivative .dpx continue to be used as the most common format for digital intermediate systems. Up until now Rank Cintel had monopolized commercial facilities. Spirit changed all that. sRGB is created jointly by HP and Microsoft for use on monitors, printers and the internet. sRGB uses the ITU-R BT.709 primariesbut has a non linear gamma and therefore looks different from rec709. Rank Cintel Ltd. introduces URSA Diamond. Pixar release Toy Story, the worlds first computer animated feature and is the highest grossing film of the year. Pixar also goes public and is the largest IPO of the year. da Vinci launches DUI interface for 888 color systems. The upgrade replaces the on board CPU with an SGI Indy computer. The Indy later became obsolete and was replaced by the SGI O2, which was affectionately known as the Toaster. I was a beta tester for the DUI while at Online Video in Zurich. BTS, formerly Bosch, introduces flh 1000 HD a revolutionary new High Definition CCD telecine that will become the Spirit. Quantel launch Domino a complete digital film in, film out editing and effects system. It is criticized for being only 8 bits but is an affordable alternative to Kodaks Cineon. ITU rec BT 709 first version approved for HDTV standard. Snow White and the Seven Dwarfs – First film to be entirely scanned to digital files, manipulated, and recorded back to film. The restoration project was done entirely at 4K resolution and 10-bit color depth using the new Cineon system to digitally remove dirt and scratches and restore faded colors. Kodak introduce Cineon for 2k and 4k digital intermediate work. 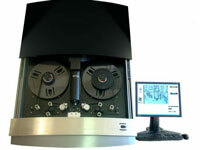 The system includes a film scanner, workstation and film recorder. Rank Cintel Mk III HD high definition telecine goes into service at Universal Studios in Hollywood. Rank Cintel Ltd. introduces URSA Gold. Sony Digital Betacam VTR launched. Soft-edged windows! How on earth did we get by without them? EFilm used their proprietary film recording technology on Disney's Honey I Blew up the Kids. Bosch launches the FDL 90 CCD line array telecine. da Vinci launches 888 digital color corrector for SD video. Not the first digital color corrector in the world (that was Copernicus) but it was my first. The Rescuers Down Under – First complete feature-length film to be recorded to film from digital files; in this case animation assembled on computers. This was a major feature set back then, everybody else was limited to six secondaries. Avid introduce Media Composer, their first editing system. The all-digital Rank Cintel Ltd URSA telecine makes its first appearance, at Montreux, with simultaneous launches in New York and Los Angeles. Rank Cintel Ltd tried unsuccesfully to force customers to use their purpose built ARCAS grading system to control it. ARCAS was never popular and failed to rival the big two hardware telecine controlers from da Vinci and Pandora. I moved to SVC Ltd. London to work on the second URSA to be delivered. This was truly a major advance in telecine technology. The Ursa was probably the first telecine that transferred negative and inter-positive films without difficulty. They revolutionizedreal-time noise reduction. Many of us believe they have always been the best. Rank Cintel Ltd launches Digiscan 4:2:2 to give digital outputs from the Mk III telecine. Avid Technology Inc formed by William J. Warner with an idea for non linear editing. The begining of uncompressed digital! Imax starts showing non fiction films in 3D. Kodak invent OLED (Organic Light-Emitting Diode) technology. Amigo, a highly sophisticated controller and pre-programmer for the Mk III is launched. VTA develop the Wiz color corrector, which became da Vinci Classic. Bosche launches fdl 60 CCD line array telecine. The telecine I trained on back at Telecine Ltd. in London. Rank Cintel Ltd introduces TOPSY, a remote control programming system the Mk III telecine. Rank Cintel Ltd launch their Mark III telecine with Digiscan, probably the first digital image store. The two frame buffer could match almost any film frame rate to any video standard and made this telecine an instant success in NTSC markets of the USA and Japan. George Lucas opens Industrial Light and Magic (ILM) to work on the effects for the Star Wars films. Rank Cintel Ltd launches Mk III flying spot telecine. Revolutionary benefits include 525 and 625 line operation and 16mm and 35mm film on the same continuous motion transport. Kodak builds the first digital camera. Engineer Steven Sasson created a camera that stored 0.01mp images on cassette tape and took 23 seconds to expose each image. BBC1 and ITV switch to color transmissions in the UK on 15 November. BBC begins the first color TV broadcasts in the UK on BBC2. Cintel Ltd produce a 16mm Telecine - The Mk II. 16mm was commonly used for news gathering. Cinema Television Ltd becomes Rank Cintel Ltd.
April 14, 1956 Ampex demonstrate the first VTR, the VRX-1000. at the National Association of Radio and Television Broadcasters Convention. The VRX-1000 was renamed the Mark IV and sold briskly at $50,000. There is a 1958 version of the VRX-1000 on show in the reception of DR Byen, a television broadcaster in Copenhagen, Denmark. The first flying spot telecine is installed at the BBC's Lime Grove studios. Cinema Television produce the first 35mm Twin Lens Continuous Motion Flying Spot Telecine - the Mark 1. It runs at 25fps to avoid visual hum, and so cannot be sold in the USA. The twin lens is needed to scan each frame twice, to get 2 fields of video. Baird Television Ltd goes into receivership, but a new company called Cinema Television Ltd is formed. The name eventually gets shortened to Cintel. Technicolor have a big year! Wizard of Oz and Gone with the Wind are released, both on Technicolor three-strip. John Logie Baird introduces the world's first telecine to scan film for television broadcast. Amongst other things it used a Farnsworth Image Dissector and gears from a Mecanno set. John Logie Baird publicly demonstrates two color, 120 line television system. The (British) Television Advisory Committee drop the Baird mechanical system in favour of the electronic Marconi-EMI system which broadcast 405 lines at 25 frames a second. First full length feature film photographed entirely on three-strip Technicolor is "Becky Sharp" by ASC member Ray Rennahan. John Logie Baird first describes his flying spot system in the BBC Annual Report. Technicolor Process Number Four is a three strip color system. First three strip Technicolor production is a cartoon by Walt Disney, "Flowers and Trees" which won Disney his first Oscar (Best Short Film Cartoon). George Eastman, founder of Kodak, took his own life on March 14, 1932. He was in poor health and suffered from a heart condition, diabetes, arthritis and adegenerative spinal disease. He left a short suicide note "To my friends, My work is done, why wait? GE"
John Logie Baird and the German Post Office, commence a series of regular television broadcasts using a flying spot system that he had invented. The black and white images had a resolution of 30 lines and were transmitted at 5 frames per second. Baird Television Ltd is founded. The company eventually becomes Cintel. Baird patents the worlds first ever Video Recording, on a 78rpm, 10 inch shellac gramophone record. The Jazz Singer is the first film with synchronized sound. Harry Nyquist, a Swedish immigrant working at AT&T shows that analog signals must be sampled at twice the resolution of the highest frequency to create an adequate representation in digital form. His theory is equally true of images. The Academy of Motion Picture Arts and Sciences (AMPAS) is founded. The first Academy Awards are announced in February 1929. Technicolor Process Number Three uses a two strip dye transfer technique to capture color. The Power of Love shown in Los Angeles and is the first 3-D movie shown to a commercial audience. The British Broadcasting Corporation (BBC) founded. Kodak introduce pre tinted stocks in lavendar, red, green, blue, pink, light amber, dark amber, yellow and orange. The Gulf Between is the first Technicolor two-color production, which pasted two negatives together. Technicolor Motion Picture Corporation founded to improve colorized pictures. Technicolor Process Number One processes is an additive method for combining two strips of panchromatic film in a special camera using a prism to create red and green “records. The Great Train Robbery is the first story told on film. It lasts 11 minutes and must have been a surprise for Louis Lumiere who is supposed to have said "The cinema is an invention without a future". Some prints had a few hand colored scenes. Kodak launches the box Brownie camera, costing just $1 and using 2 1/4 inch square negatives. Photography becomes accessible to everyone. The Pocket Kodak is launched, costing $5 and is indeed small enough to fit in a pocket. Edison produces the first hand tinted film "Annabelle Serpentine Dance". The veils of Annabelle Moore change color as she dances. Auguste and Louis Lumiere are credited with the first public film screening on December 28th. The ten films last about 20 minutes and were shown by Cinematograph. I guess this must be the birth of Cinematography! British William Friese-Greene files a patent for a 3-D movie process using two films projected side by side on screen while the viewer looks through a stereoscope to converge the two images. Edison's Kinetoscope, the first modern cinematic machine to employ film arranged images in a loop. The earliest Edison motion pictures were filmed at the "Black Maria", which was a film studio built in 1893. The first public demonstration of a Kinetoscope was at the Brooklyn Institute on May 9, 1893 and the first Kinetoscope parlor opened in midtown Manhattan on April 14, 1894. George Eastman makes up a name. Kodak. The name has no meaning in any language and became the most recognizable brand name in the world. The first Kodak camera goes on sale with the slogan: "You press the button, we do the rest." It cost $25 and took 100 pictures. German engineer Paul Nipkow discloses details of his spinning disc that contained small holes around the perimeter, which could scan a still picture on to a light sensitive cell as a series of lines. Nipkow was the first person to realise that moving pictures might one day be scanned line by line, fast enough to take advantage of the persistence of vision. Parisian Etienne-Jules Marey constructs a camera (or "photographic gun") that could take 12 photographs per second of moving animals or humans and calls it Chronophotography or serial photography. The gun like appearance might be the source for the expression "to shoot a film"
Frenchman Maurice LeBlanc describes a mechanical scanning system using mirrors for telegraphic transfer of an image. Muybridge invents the Zoopraxiscope to display his image series. Eadweard Muybridge uses trip wires to photograph a horse in motion and settle a bet. These are regarded as the first photographic motion pictures. Maxwell demonstrates to the Royal Society of London. He shows that any color can be produced by mixing light from a red, a green and a blue lantern. In the demonstration he projected the first color photograph, a tartan by Thomas Sutton. The theory is the basis of color displays even today. Charles Wheatstone is the first to describe Stereopsis and explain binocular 3D vision. He created stereo drawings and the first Stereoscope to view them with. Joseph Niepce takes the world's first photograph of some farm buildings and the sky. It has an exposure time of 8 hours. Niépce calls the first ever photograph a 'heloigraph' or sun-drawing. He uses a pewter plate and Bitumen of Judea to create a positive image, without the negative stage used today.The bitumen hardened in the sun, and Niepce removed the softer "unexposed" bitumen with a mixture of oil of lavender and white petroleum. Today this 'heliograph' is kept sealed in an air tight case within an inert atmosphere at the University of Texas.